My friend Carl from high school sent me a message on Facebook asking if we could make 2 graduation cakes for his twin daughters who are fraternal twins, not identical so he wanted two different cakes. Kiersten likes vanilla cake and her favorite color is purple so this is the cake we made for her. It is a White Sour Cream Cake (the White Almond Sour Cream Cake recipe without the almond flavoring using a white cake mix – it was so yummy and I don’t even like white cake!) with Vanilla Buttercream Frosting and White Buttercream Fondant. 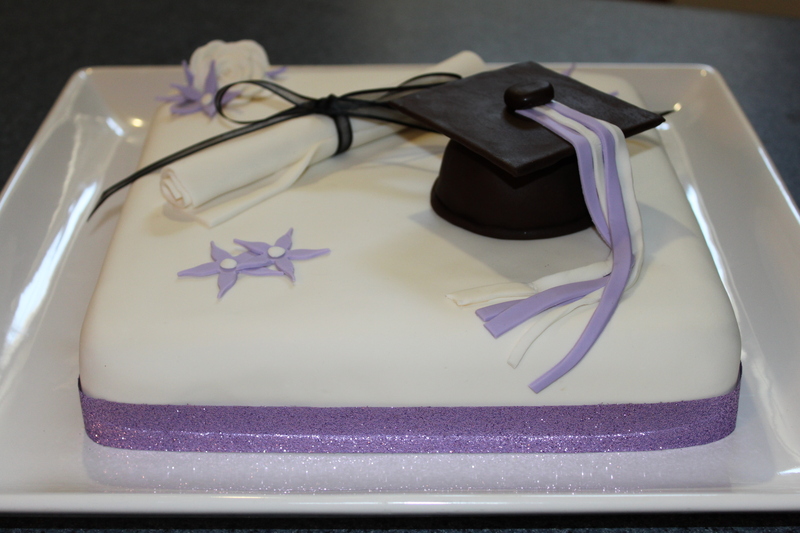 The diploma is a roll of fondant and the graduation cap is a cocoa cupcake covered in chocolate fondant with the top of the cap a piece of cardboard covered with chocolate fondant and the tassels made out of fondant. Happy Graduation Kiersten and Congratulations! GREAT CAKES AND VERY CREATIVE! !